The defender will often find it expedient to attack the flank of an enemy penetration with the objective of cutting off and destroying the hostile forces that have broken through. Such tactics are effective only when a secure shoulder provides the defender with a spring board for an attack which is launched straight across the gap to the other shoulder, or when a natural obstacle, such as a large body of water or a swamp, serves as an anvil against which he can crush the attacker. An effective flank attack requires a balanced force with adequate striking power whose strength need not necessarily exceed one-third of the total enemy forces committed in the break-through. The more powerful and mobile the force, the quicker the defender will attain his objective. Unsupported infantry is incapable of mounting a successful flank attack against an armored penetration. In such a situation infantry must always be supported by strong assault gun and armored units as well as sizable antitank forces. The defender who attacks the flank of an enemy penetration runs the risk of exposing his own flank and must therefore take this factor into account when he plans the counterattack. The danger is usually less serious than anticipated because, during the initial stages of the break-through, the attacker usually commits his forces almost exclusively along the axis of advance without giving much attention to his flanks. These rush tactics are practical, however, only so long as the defender has neither the means nor the opportunity for immediate, effective counteraction. During their invasion of Russia in 1941, for instance, the Germans did not present the Russians with any such opening. On the other hand, during the Eussian counteroffenses in 1942, the German command always had strong armored forces at its disposal, making it inadvisable for the enemy to be careless in exposing his flanks. Bitter experience was to teach the Russian that flanks must be protected until he finally made them so tank-proof that they could only be overpowered with heavy casualties. For this reason the German flank attacks gradually lost their sting after 1943 and were more often repulsed. Flank attacks are particularly effective when employed to eliminate hostile river crossings. The forces which cross first can usually be shattered or wiped out without too much difficulty because they rarely have adequate defensive protection. This happened, for instance, along the Teterev in December 1943. The defender will find it much more difficult, well-nigh impossible, to eliminate a strongly fortified enemy bridgehead which has adequate fire support from the far bank of the river. One of the simplest methods of sealing off a breakthrough or eliminating a penetration is the frontal counterattack. Usually, such a counterattack can be launched only if the breakthrough is minor and can be localized, and if both shoulders are secure. Moreover, sufficient reserves must be available to close the breach by a quick counterthrust before the enemy is able to widen the gap. Once hostile preparations for a breakthrough have been clearly recognized, it is most effective to move the reserves close to the rear of the threatened sector. While the reserves must be close enough for instantaneous effective employment, they should be sufficiently removed from the front line so as not to forfeit prematurely their freedom of maneuver. In their assembly areas the reserves must be concealed from enemy observation and air attacks and must not be exposed to hostile preparation fire. Obviously, reserves should have maximum fire power and mobility; armored divisions come closest to these requirements because they combine tremendous striking force with concentrated fire power. Infantry supported by assault guns will often restore the situation so long as the breakthrough is local. 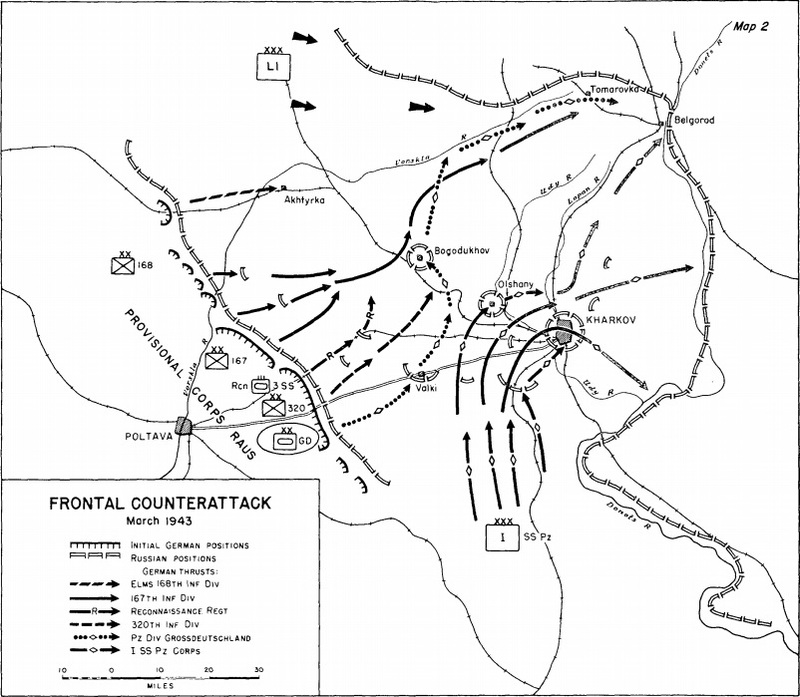 A counterattack is far more complicated if, before its effect is felt by the enemy, the shoulders begin to crumble, the breach is widened, and the enemy attack gains ground in depth. But even in this event, it is best to maintain the tactical integrity of the reserve so that upon commitment it can overrun the enemy infantry in one powerful thrust and regain the key positions of the former line. Only then should attempts be made to close the smaller gaps by flanking actions. As a countermeasure against the disintegration of the shoulders and as support to the flanking actions, it will prove effective to protect the open flanks of the break-through area with artillery and to assemble small local reserves behind them. Frequently one infantry company supported by assault guns will suffice for this purpose. 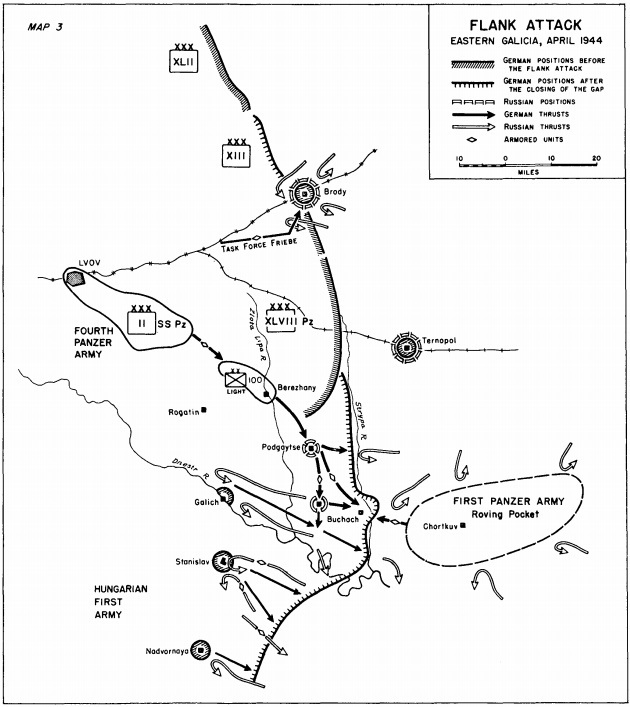 Whenever the enemy achieves a major breakthrough that causes the collapse of a wide sector of the front (thirty miles or more), the local reserves will always be insufficient to close the gap by frontal counterattack. Piecemeal commitment of individual divisions in a gap of this width will simply lead to their engulfment by the advancing hostile avalanche. Only a strong force consisting of several corps will be able to stem the tide and halt the enemy advance in the depth of the defense or to close the gap by a counterattack. There will usually be a considerable time lapse, however, before a force of such strength can be released from other sectors and moved to the breakthrough area. Meanwhile, attempts must be made to narrow the breach by withdrawing to a shorter line and by strengthening the resistance in the sectors adjacent to the gap. The first reference to operational art as a concept of military art has been attributed to Aleksandr Svechin, officer of the Imperial General Staff and military specialist in the service of new Bolshevik state. According to first professor of operational art at the Red Army’s military academy N. Varfolomeev, Svechin had first used the term in 1922 in conjuction with his lectures on strategy. At that time he defined operational art as a critical conceptual linkage between tactics and strategy. In this manner, senior commanders transormed tactical successes into operational bounds to achieve strategic objectives. Svechin specifically called attention to the growing complexity of warfare since the wars of the French revolution and noted that the conduct of military operations had become ‘more complex and profound’ and that contemporary commanders could not count on success in any operation, unless they undertook preparations to solve the problems that would appear in course of operation. Strategic foresight was necessary for the conduct of successful operations. He defined operational art by referencing its relationship to tactics and strategy. If tactics solve immediate problems and strategy pursues goals defined by the political leadership, then operational art governs tactical creativity and links together tactical actions into a campaign to achieve strategic goal. As an alternative to destruction, Svechin offered a strategy of attrition. It was a strategy that was not limited to operational art, but was politically and economically informed. While destruction is driven by its own logic to seek an immediate decision in a campaign, attrition, depending on the intensity of armed conflict, can range from close to destruction to the abscence of combat operations. A strategy of attrition allows for the shaping of a conflict and for continued political engagement to redefine the conflict to one’s advantage in both domestic and international terms. Under such a strategy, the guidance of operations is under the direction of the integral military command, and the conduct of operations in a particular theatre depends upon the general staff. Panzers were an art form, like the ‘German way of war’ itself – their structure and employment defy logical analysis. Blitzkrieg controversy connected to concept of operational art and place of panzers in it. German victories of 1939-40 were not consequences of doctrine or planning. They developed from a series of accidents and coincidences reflecting operational improvisation born of necessity to avoid a drawn-out war of attrition and responding to strategic imperatives generated by essentially random nature of the National Socialist regime. Blitzkrieg was certainly not a structure of concepts like AirLand Battle or counter-insurgency, expressed in manuals, taught in schools and practised in manoeuvres. The word appeared in German military writings not in a specific case, but to refer to the kind of quick, complete victory that was at heart of the army’s operational planning. Blitzkrieg is a manifestation of the war of movement, that was a historical focus of Prussian-German military planning.